(Nanowerk News) It has been argued that the ability of humans to recognize social signals is crucial to mastering social intelligence - but can robots learn to read human social cues and adapt or correct their own behavior accordingly? In a recent study, researchers examined how people react to robots that exhibit faulty behavior compared to perfectly performing robots. The results, published in Frontiers in Robotics and AI ("To Err Is Robot: How Humans Assess and Act toward an Erroneous Social Robot"), show that the participants took a significantly stronger liking to the faulty robot than the robot that interacted flawlessly. "Our results show that decoding a human's social signals can help the robot understand that there is an error and subsequently react accordingly," says corresponding author Nicole Mirnig, PhD candidate at the Center for Human-Computer Interaction, University of Salzburg, Austria. Although social robotics is a rapidly advancing field, social robots are not yet at a technical level where they operate without making errors. Nevertheless, most studies in the field are based on the assumption of faultlessly performing robots. "Alternatives resulting from unforeseeable conditions that develop during an experiment are often not further regarded or simply excluded," says Nicole Mirnig. "It lies within the nature of thorough scientific research to pursue a strict code of conduct. However, we suppose that faulty instances of human-robot interaction are full with knowledge that can help us further improve the interactional quality in new dimensions. We think that because most research focuses on perfect interaction, many potentially crucial aspects are overlooked." 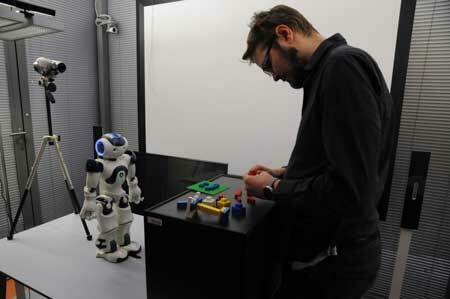 To examine the human interaction partners' social signals following a robot error, the research team purposefully programmed faulty behavior into a human-like NAO robot's routine and let the participants interact with it. They measured the robot's likability, anthropomorphism and perceived intelligence, and analyzed the users' reaction when the robot made a mistake. By means of video coding, the researchers could replicate their findings from earlier studies and show that humans respond to faulty robot behavior with social signals. Through interviews and user ratings, the research team found that somewhat surprisingly, erroneous robots were not perceived as significantly less intelligent or anthropomorphic compared to perfectly performing robots. Instead, although the humans recognized the faulty robot's mistakes, they actually rated it as more likeable than its perfectly performing counterpart. "Our results showed that the participants liked the faulty robot significantly more than the flawless one. This finding confirms the Pratfall Effect, which states that people's attractiveness increases when they make a mistake," says Nicole Mirnig. "Specifically exploring erroneous instances of interaction could be useful to further refine the quality of human-robotic interaction. For example, a robot that understands that there is a problem in the interaction by correctly interpreting the user's social signals, could let the user know that it understands the problem and actively apply error recovery strategies." These findings have exciting implications for the field of social robotics, since they emphasize the importance for robot creators to keep potential imperfections in mind when designing robots. As opposed to assuming that a robot will behave perfectly, embracing the flaws of social robot technology might pave way for the development of robots that make mistakes - and learn from them. This would also make the robots more likeable to humans. "Studying the sources of imperfect robot behavior will lead to more believable robot characters and more natural interaction," concludes Nicole Mirnig.